The Kansas high school football season is officially underway after an exciting opening night. 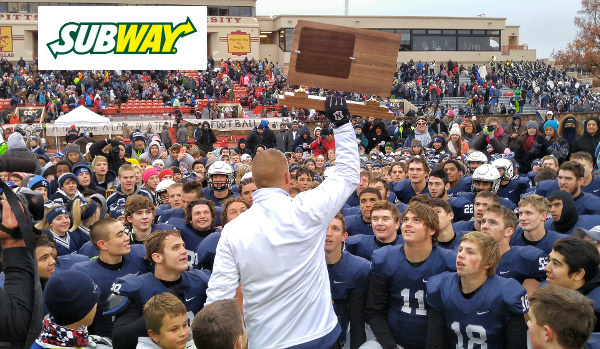 We are excited to once again have Subway on board to sponsor our Friday Fresh Take where we provide our initial reaction to some of the most notable games and performance in the state each week. Preseason rankings are just that; preseason rankings. While they offer excitement and entertainment value, they are more often than not, the least accurate set of rankings of any given season. Leading into this week we talked a lot about several big match-ups to kick off the 2016, and the opportunity for quite a bit of movement in the rankings after this week. When the dust settled on Friday night, we had a total of 11 ranked teams go down, including three No. 1-ranked teams. We promise things will settle down somewhat as the season progresses, but let’s take a look at some of the movement. Last season, four of the top five ranked teams in Class 5A lost in Week 1. On Friday night, we had even more shakeup in the Class 5A rankings as three teams dropped their opener. Let’s start at the top where Wichita Northwest outscored Bishop Carroll for the second straight season. The Grizzlies outscored Carroll 26-12 in the second half en route to a 61-49 win. Northwest QB Austin Anderson, one of Kpreps Breakout Players for 2016, made his debut by passing for 386 yards and six touchdowns. He also added 91 yards rushing and a touchdown on nine attempts. It was Carroll that jumped out to a quick 14-0 lead after a turnover and a defensive stand. The Eagles would maintain that 14-point lead until the second quarter when a Jahlyl Rounds touchdown run and a long touchdown pass from Anderson to Martese Mullins pulled Northwest to within 35-33 at the half. The Grizzlies would take their first lead, 40-35, at the 8:16 mark of the third quarter when Anderson hooked up with Mullins for a third touchdown. Northwest would score twice more on touchdown passes from Anderson to Jaxon Reynolds and Rounds to extend its lead to 54-35 in the fourth quarter. The Grizzly scoring barrage ended at 34 consecutive points when Carroll’s Adam Theis’ touchdown run pulled the Eagles to within 54-42. Anderson would then break a 68-yard touchdown run to cap the Northwest scoring. Two Grizzly receivers went over the 100-yard mark with Mullins gaining 162 receiving yards and three scores, and Reynolds adding 137 yards and two touchdowns. Northwest was just as good on the ground as Rounds rushed for 117 yards and two scores, while Myles Garner added 131 yards rushing. Much had been made about all the talent that graduated from Mill Valley’s 2015 5A state championship team. Despite only returning a handful of players with starting experience on either side of the ball, the No. 3 Jaguars made a statement on Friday night by beating No. 4 St. James Academy, 35-13. Quarterback Brody Flaming passed for 310 yards and five touchdowns in leading the Jaguars to the victory. The Thunder threatened to cut into the Mill Valley lead before half, but St. James Academy fumbled on a fourth-down play deep in Jaguar territory. Mill Valley went to the break with a 21-7 lead. St. James Academy quarterback Sammy Wheeler passed for 125 yards, but was intercepted twice. It was the first Eastern Kansas League game for both schools, which joined the league this season. Defending 6A champion Derby cruised to a 55-20 win over Goddard-Eisenhower on Friday night. New Panther quarterback Dan Dawdy passed for 150 yards and a touchdown, and rushed for two more scores. Brody Kooser led Derby with more than 130 yards rushing and a pair of touchdowns. Derby’s lead ballooned to 55-7 in the third quarter before the Tigers added a pair of late touchdowns. The marquee game in the state certainly lived up to its billing once again. Blue Valley, ranked No. 3 in Class 6A, used a fourth-quarter interception and a late forced fumble to hold off Class 4A-I’s No. 1 Bishop Miege Stags. The Tigers defeated Miege 42-35 in Week 3 a season ago. Blue Valley held a slight 14-13 lead at halftime, and the teams traded touchdowns in the third quarter. The Stags opened the third quarter with a Carter Putz touchdown pass to Tommy Winklhofer and two-point conversion to lead 21-14. William Evans scored from a yard out to bring the Tigers back even, 21-21, with just under five minutes remaining in the third quarter. Miege took the lead right back when Putz hit all-state receiver Jafar Armstrong on a 65-yard touchdown pass for a 28-21 lead. Blue Valley would again respond as quarterback Matt Dercher connected with Gus Gomez for a third touchdown pass to tie the game at 28. The game stayed knotted at 28 until around the 9:00 minute mark of the fourth quarter when Evans scored from 8-yards out as part of his 228-yard rushing effort on the night. Miege threatened later in the fourth quarter, but Putz was picked off by Brody Jacobsen, and a later fourth-down play ended in a sack and forced fumble. In perhaps the game of the night, Class 6A’s No. 5 Shawnee Mission West Vikings scored in the final 30 seconds to shock Lawrence Free State, 41-40. Viking quarterback Zach Witters tossed a 15-yard touchdown pass to running back Jason Meeker with :28 seconds remaining to give West a 41-40 lead. The Vikings two-point conversion failed. Just over a minute earlier, Free State quarterback Dallas Crittenden (a Topeka Hayden transfer) hit Zack Sanders on a 49-yard touchdown pass to give the Firebirds a 40-35 lead. But West would go 70 yards on their final drive in just over a minute to pull out their second consecutive season-opening win at Free State. The Vikings topped the Firebirds 34-26 in Lawrence to open the 2015 season. Witters put up a ridiculous 523 yards of total offense for Shawnee Mission West. The senior quarterback rushed for 217 yards and three touchdowns, and passed for 306 yards (on only 12 completions) and two more scores. Crittenden passed for 300 yards and a touchdown and added a rushing score in his Firebird debut. Free State’s Sanders hauled in 13 receptions for 239 yards and a touchdown. Third-ranked Buhler jumped out to a 14-0 first-quarter lead and held off No. 5 McPherson, 26-13. The Crusaders extended their lead to 20-0 after a Bullpup botched punt snap. McPherson would score consecutive touchdowns in the second and third quarter, both on pass from Casen Hoover to Jack Reifschneider, to pull within 20-13. The Bullpups would threaten again after a blocked punt, but the Buhler defense would hold. Dalton Brown would later ice the game for the Crusaders with a 1-yard touchdown run with under three minutes remaining. For the third consecutive season, Central Prairie League powers Central Plains and Victoria met in a Week 1 showdown. On Friday night it was the Central Plains Oilers than pulled away from Victoria for a 48-22 win and in doing so halted the Knights’ 24-game winning streak. The loss also was the first home defeat for Victoria since Week 2 of the 2012 season. Victoria came in as the two-time 8-Man, Division II state champions, and returned the opening kickoff for a touchdown and an early 8-0 lead. The Oilers responded to build a 26-8 lead at halftime, and 34-14 after three quarters. Topeka Hayden is new to Class 4A-II, but the Wildcats are not new to challenging themselves with larger Centennial League competition. Hayden opened the 2016 with a 30-13 loss to 6A contender Topeka High on Friday night. Topeka trailed Hayden 7-6 at halftime, but speedy quarterback Corey Thomas scored on a short touchdown run to put the Trojans up 14-7. Tomas Stringer scored late in the third quarter to pull Hayden to within 14-13, but Topeka’s Thomas answered right back with a 29-yard scoring run for a 21-13 lead after three quarters. The Trojans blocked a Hayden punt for a safety and a 23-13 lead before later scoring on a 29-yard touchdown run by freshman Miekyah Thomas, who finished with 103 yards on the night. Corey Thomas led the way for Topeka High with 178 yards on the ground and three scores. The Hays Indians rallied for 21 points in the fourth quarter to beat 4A-II No. 2 Scott City, 31-21. The Indians grabbed a 10-7 halftime lead before Scott City scored twice to take a 21-10 lead into the fourth quarter. The Indians began their rally with a 35-yard Hunter Brown touchdown pass to Collyn Kreutzer to pull within 21-17. A Beaver fumble set Hays up deep in Scott City territory leading to a Brown touchdown pass to Shane Berens and a 24-21 Indian lead with 7:25 remaining. Scott City’s next two drives ended in interceptions and Brown hit Berens again on a 25-yard touchdown pass with under a minute to go. Friday marked just the fourth all-time meeting between the schools with Hays now holding a 3-1 advantage. Atchison and 4A-II No. 5 Holton entered the fourth quarter tied at 14, but it was the Redmen scoring 10 points in the final 12 minutes to win 24-14. Atchison quarterback Adam Smith connected with Bryce Enzbrenner on a 53-yard touchdown pass with 6:20 remaining to put the Redmen on top. Atchison would add a field goal with under a minute to go for the 10-point advantage. Holton lost its season opener for a third consecutive season. Senior quarterback Hayden Friend had a hand in all three Plainville touchdowns as the Cardinals got by Smith Center, 20-16. Friend threw a 30-yard touchdown pass to Ryan Buresh on a fourth-down play to open the score in the first quarter. After Smith Center took an 8-6 lead in the second quarter, Friend once again tossed a fourth-down touchdown pass – this time to Justin Reif for a 14-8 halftime lead. In the third quarter, Friend scored on a 7-yard run to put the Cardinals up 20-8. Smith Center would pull closer on a 20-yard touchdown run from Kaden Meitler, but the Redmen’s desperation pass attempts into the end zone were knocked down. Friend led Plainville is passing for more than 150 yards, while Logan-Palco transfer Riley Nyp rushed for 80 yards. Meitler rushed for 125 yards to pace Smith Center ground game. In a battle of two 3A contenders, Garden Plain held off a late charge by the Hesston Swathers to secure a 33-27 season-opening win. The Owl offense stayed grounded in churning out 413 rushing yards and averaging nearly 8 yards per carry. Garden Plain’s Nate Pauly rushed for 287 yards and four touchdowns on the night. Pauly’s three first-half touchdowns helped Garden Plain build a 21-7 lead at the break. Hesston would get as close as 27-21 late in the third quarter after Parker Roth scored from three yards out. The lead would remain at six points for much of the fourth quarter until Pauly broke a 68-yard run with under three minutes remaining to give the Owls a 33-21 lead. Hesston would strike back just over a minute later as quarterback Zach Esau tossed a 20-yard touchdown strike to Tanner Bachman to pull within 33-27. Esau threw for 287 yards and a pair of touchdowns, but was intercepted twice on the night. He also led the Swathers in rushing with 93 yards and a score on 17 attempts. Hesston committed four turnovers in the game. Marysville opened the 2015 season with a 35-19 win over St. Marys to stop the Bulldogs 32-game losing streak. Fast forward one year later, and the Bulldogs narrowly took down the two-time defending 3A state champion Rossville Bulldawgs. In the end, Rossville escaped with a 27-20 victory to extend their winning streak to 29 consecutive games. Marysville led 20-14 in the fourth quarter before Jacob Bradshaw hit Cole Schumacher on a 7-yard touchdown pass to tie the game at 20. Bradshaw then scored on a 3-yard run for a 27-20 lead. Marysville used a long pass play to get just inside the Rossville 20-yard line in the final seconds, but three ensuing shots to the end zone fell incomplete. Bradshaw rushed for more than 150 yards and two scores, and passed for 185 more yards and a touchdown. After Pittsburg starting quarterback Chase Curtis went down with an injury, the Purple Dragons committed six turnovers and fell 28-7 to the Harrisonville Wildcats. Harrisonville (3-0), the third-ranked team in Missouri Class 4, converted three of the turnovers into touchdowns. Pittsburg (0-1) scored on its first possession when Noah Vaughn capped a 68-yard drive with a 4-yard touchdown run at the 5:15 mark of the first quarter. The Wildcats scored the game’s next 28 points. After Curtis was knocked out of the game in the second quarter, the Dragons lost four interceptions and two fumbles. A pair of turnovers in the final two minutes of the first half led to Harrisonville scoring two touchdowns and taking a 21-7 halftime lead. Sophomore Ty Roark finished the game at quarterback for Pittsburg. Curtis’ status for next week’s game at Chanute is unknown.